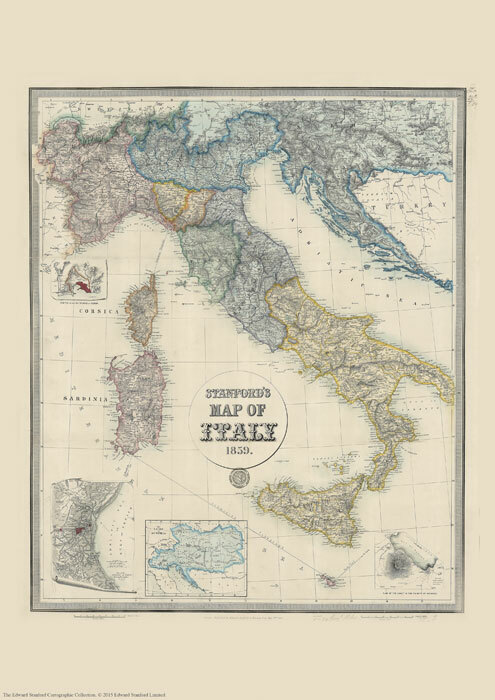 The Stanford’s Map of Italy is from a fascinating series of reproductions from our Edward Stanford Cartographic Collection archive. This is a reproduction of a map originally published on 2nd May 1859 by Edward Stanford, the founder of our company. 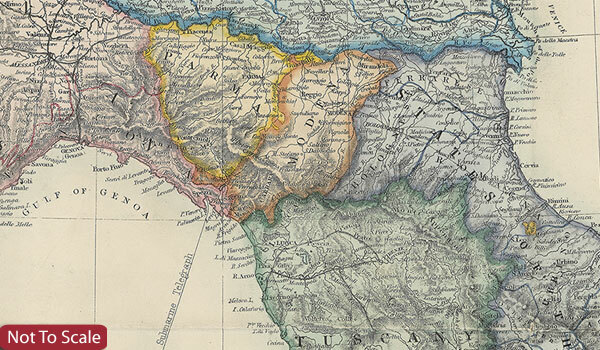 The map catches the country in an interesting stage of its history, just before the unification, and still shows the individual states: the Kingdom of Piedmont - Sardinia, the Grand Duchy of Tuscany, the Kingdom of the Two Sicilies, the Papal States, etc, all in different colours. Hachures are used to show the spine of the Apennines and other mountainous regions. Interesting insets show enlargements of the environs of Venice, Genoa and Naples with Vesuvius, and another panel presents the whole of the Austro-Hungarian Empire which then still included Lombardy and north-eastern Italy. This reproduction was taken from what used to be called a “cloth-dissected” map, made when the map itself was cut into sections and each section then individually pasted onto an overall cloth backing for the whole map. In this version the whole map is backed onto cloth in one piece but the gaps between the sections have been reproduced in the printing to preserve the style and the feeling of the original. This is the A4 canvas version. This lovely map will appeal to anyone interested in this great country.